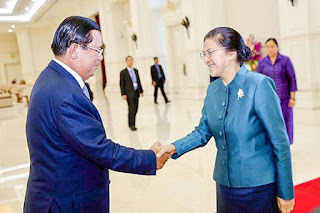 Cambodian Prime Minister Hun Sen posted on his Facebook page that he discussed the dam proposal with visiting Lao National Assembly president Pany Yathotou on Saturday, the Khmer Times reported on Monday. “Cambodia supports Laos with Don Sahong dam construction and allows Laos to use roads and ports to [trade] goods because Laos has no sea,” he wrote, speaking about an agreement to boost bilateral trade. The prime minister’s post said Pany had agreed to sell electricity generated by the dam in the Lao province of Champassak to Cambodia at affordable prices to boost development of the border region. Last week, the prime minister met with the leaders of Laos and Vietnam to discuss the ongoing development of the provinces in all three countries that are near the dam and that are presently deemed underdeveloped. In Stung Treng province’s Pharla Baravat district, Sous Chanphal, a Preah Rumel community deputy chief, told the Khmer Times that the dam would damage tourism, which focuses on the critically endangered Mekong dolphin and the region’s natural beauty. He also had fears about contamination as well as the exploitation of existing natural resources required for its construction and called on both governments to reconsider building the dam. “I think if the dam began operating we will die before the [few remaining] dolphins, because the dolphins have begun to move already,” he said. The 30-metre high, seven-kilometre long dam will produce up to 360 megawatts of electricity once built and according to construction company Mega First Corporation Berhad, environmental impact surveys showed no evidence of damage to local ecosystems. Opponents, however, claim that up to 6 million Cambodians who rely on the Mekong River’s fish stocks for their livelihoods are likely to be greatly affected. In October, 90 regional NGOs met with the Cambodian Environment Ministry to discuss concerns over developments on the Mekong River. Youth for Social and Environmental Protection representative Chum Huot, a long-time environmental activist, expressed his concerns on Sunday about the prime minister’s most recent support for the dam. “In the past, the prime minister has always made protest letters and requested Laos to examine clearly about the impact, joining with NGOs concerning the possible impacts,” he told the Khmer Times.